Feminists for Life’s pro-woman, pro-life lectures create a groundswell of support for FFL Pregnancy Resource ForumsSM by raising awareness about the needs of pregnant students and student parents, sparking a discussion about pregnancy resources available on campus, and emphasizing needed improvements. FFL’s Pregnancy Resource Forums then move the discussion beyond the polarizing abortion debate to a working dialogue, inviting key campus policymakers and students to work together toward solutions for pregnant and parenting students. Read more about Feminists for Life’s groundbreaking Pregnancy Resource Forums below. What exactly is an FFL Pregnancy Resource Forum? An FFL Pregnancy Resource Forum is a panel discussion of university administrators and community resource leaders. Pregnant women, parents, and birthparents are also invited to be a part of the panel or contribute as audience members. Led by an FFL moderator who takes an inventory of pregnancy and parenting resources on and off campus and shares solutions from other campuses, the forum guides audience members and panelists to set goals and create a tailor-made plan for your university. How did FFL’s Pregnancy Resource Forums start? “That powerful statement took Feminists for Life’s philosophy to the next level: Create real solutions for those with the highest risk of abortion, and focus on future leaders. At the end of the meeting, we knew that we could actually change the direction of the debate. Rather than simply arguing over one of the worst things that could happen to women — abortion — we would focus on transforming society by advocating for solutions so that abortion would become unthinkable,” Foster said. The first-ever FFL Pregnancy Resource Forum was held in 1997 at Georgetown University. Representatives from Health Education Services, Residential Life, Campus Ministry, and the nearby Northwest Pregnancy Center participated. After this first forum, which became a model for the nation, Georgetown University employed a full-time Pregnancy Services Counselor at Health Education Services who offered pregnancy and sexual assault counseling services. Hoya Kids Learning Center, a daycare facility, opened that same year. A year later, the office of Health Education Services implemented free home pregnancy testing kits and a pregnancy hotline. Georgetown University’s pro-life student group, GU Right to Life, started a volunteer babysitting co-op and organized diaper drives for the local Northwest Pregnancy Center. What can an FFL Pregnancy Resource Forum accomplish on a college campus? Since that first groundbreaking forum at Georgetown, Feminists for Life has held Pregnancy Resource Forums at many schools, including Boston College, University of Maryland, Northwestern, University of Illinois, Pepperdine, George Washington, Fordham, University of Virginia, Stanford, Harvard, Notre Dame, Berkeley, Swarthmore, University of Chicago, Tulane, Oberlin, Gonzaga, and Johns Hopkins. Georgetown University continues to host a Pregnancy Resource Forum each year to reevaluate and improve upon resources. See the complete list of Forums. Read more about the pro-woman, pro-life solutions FFL’s Pregnancy Resource Forums have inspired below and check out praise for the forums. How can I host an FFL Pregnancy Resource Forum at my school? FFL also recommends this event become an annual event. This program became the inspiration for part of the Pregnancy Assistance Fund. Federal grants are awarded to qualifying states every three years until 2020.
on campuses across the nation inspired by FFL Pregnancy Resource Forums. • Following an FFL lecture on campus in 2009, student parents at Loyola University in Chicago were inspired to establish an informal childcare co-op to help meet the needs of student parents and their families. • The pro-life student group at University of Maryland created a Pregnancy Resources Committee, as well as a new Pregnant and Parenting Services website. • Saginaw Valley State University in Michigan created a Pregnancy and Parenting Services school website, streamlined and improved the Health & Counseling Services offices’ ability to help pregnant students, and trained Financial Aid staff in assisting student parents. • A student parent support group was established at Xavier University, offering educational materials and emotional support. • An entire network of student-parent support was strengthened at Grand Valley State University in Michigan, emphasizing collaboration between the on-campus Women’s Center, the Children’s Center, and the Health Center. Improvements included the installation of diaper decks in restrooms, lactation stations and nursing rooms for student mothers, and an online database to advertise resources and connect student parents. • After Serrin’s speech, Wellesley pro-life and pro-choice students held a back-to-school rummage sale with items students left at the end of the previous school year. They raised over $4000 to help student mothers on campus. • Students at the University of Virginia established free babysitting services for student parents. • North Carolina State University held a potluck dinner to help connect parenting students to one another, encouraging them to form their own network of support. • After FFL Honorary Co-Chair Patricia Heaton spoke at to a packed hall at Pepperdine University in California, Dean Mark Davis invited Serrin Foster to moderate a Pregnancy Resource Forum. Before the Forum, Heaton and Foster met with members of the task force dedicated to examining campus resources and developing proposals for improvement. 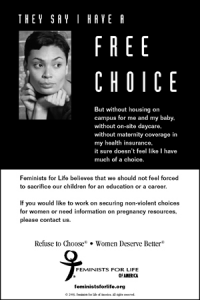 • Realizing that some women who had just learned of their pregnancies were not aware of all the resources available on and off campus, a new handout was created for women who had just learned they were pregnant from health center staff. Pregnant women learned they wouldn’t be thrown out of school and given practical resources. Family housing was also created, and the Student Handbook was modified to include pregnancy resources and information. In 2003, Cindy Brown (now Vice Chair of FFL’s Board) served as executive director of Room at the Inn (RATI), a pregnancy resource center and maternity home based in Charlotte, North Carolina. When one of the Room at the Inn board members, Abbot Placid Solari, offered a donation of land, its Board of Directors envisioned a new pregnancy care center located adjacent to the campus of Belmont Abbey College. As Cindy was researching in preparation for a board strategic planning meeting, trying to determine who most needed help and identify gaps in services, she found Feminists for Life’s website. “FFL’s was the most complete, helpful, and strategically focused website aimed at identifying and assisting the highest risk group,” Cindy said. “Major light bulbs went off for me, and subsequently for the Board of Directors. The Abbot insisted on an FFL lecture at Belmont Abbey College immediately after seeing FFL’s materials.” With the help of Serrin Foster and FFL’s College Outreach Coordinator, Cindy organized Feminists for Life lectures at Belmont Abbey College, UNC-Charlotte, and Davidson. Cindy then invited Serrin Foster to meet and talk with the Room at the Inn’s Board and strategic planning committee. Since 2003, Room at the Inn has raised half of the $3 million needed to build and staff its new facility at Belmont Abbey College. As you can see, once you begin making a list of ways student activists can help pregnant students and parents on your campus, the possibilities are endless! When you create small steps for change and work to revolutionize your entire campus, you help make the crucial difference for women and children on campus. Share your creative solutions and keep the revolution alive! We want to know about your efforts – so be sure to keep us updated on what you are doing on your campus to support pregnant and parenting students. Send your ideas to coordinator@ffloncampus.org so we can share your progress with other pro-life student leaders! Laura Notess, Fordham University. FFL Moderator: Serrin M. Foster, November 18, 2010.